This pretty girl is Bella. 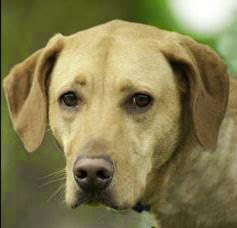 She's a Labrador Retriever and Vizsla mixed breed dog who is 4 years and 9 months old. Her owner had to move out of town and could not take Bella along, so she's waiting at Wayside Waifs in Kansas City for a new loving home. I'm Bella and I'm looking for a new home. I'm a beautiful girl....fun, playful, and affectionate, too. I just need a home and family, that's all, and then my life will be perfect. 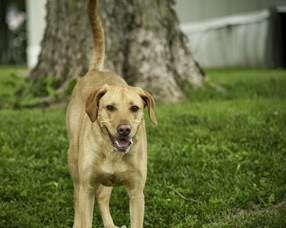 I am a 4 1/2 year old, 61 pound, already housetrained and crate trained, Labrador Retriever/Vizsla mix. I came to Wayside when my owner was moving out of town and couldn't take me with her. We had been together for the past several months and I was with a friend of hers before that. My life has been sort of crazy lately, so I'd love a little stability and peace and quiet. Don't get me wrong though, I love to stay active and busy, but I'd just like a consistent routine of a daily walk or run or hike with my loved one. That's my idea of a great way to stay active. That's not asking too much, is it? I love to spend time with my people! Wherever you are, I'd love to be with you. I'm a perfect combination of active yet chilled out and relaxed. I'm quiet and well behaved in my kennel at Wayside. And when you get me out, I love to play fetch and play with toys and spend time showing you my tricks. I already know 'sit', 'down', 'come', and 'shake', and I'd love to learn more! 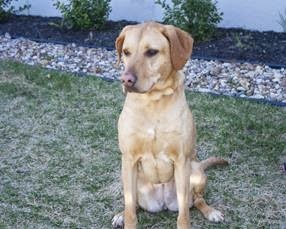 My previous owner described me as a playful and affectionate, sometimes goofy, lap dog who soaks up attention from my people. I'm looking for an owner who likes to have their dog by their side whenever possible. I even like to eat when you're near me! I was completely housetrained in my previous home and never bothered a thing in the house when I was left by myself. I slept through the night on my dog bed or with my owner and never made a peep. I do know how to jump a fence though, and I might do that or dig if I get bored alone in my yard. Please supervise me when I'm outside and don't leave me alone in the yard all day. Please be patient and gentle and calm with me as I get acclimated to my new home. I've been through lots of change in my life and that can be tough for a dog who craves consistency and routine. I'll do my best to make you happy, once I figure out exactly what that means. So please offer me praise and treats when I'm a good girl. That will help me be the confident, well behaved dog I know I can be. I'd love to be the only animal in my new home. I've lived with other dogs before, but that didn't always go so well. They didn't always want to listen to me and I didn't like to back down. So I'll need a home without other dogs or cats or other small, furry animals, please. I hope you don't mind me being your whole focus of attention! I promise to shower you with so much love that you'll be fine with just me! And please let me meet the whole family before we go home together, so that we can be sure we all get along great. I was recently adopted for awhile, but I didn't get along with the 4 year old in my home, so Wayside staff thinks I'll be happiest in a home without kids under the age of 10, just to be safe. I just want to fit in. I want to belong. I want you to love me and feel like you need me in your life. I want your life to be better because I'm in it. I'll work every single day for the rest of my life to make all of that happen. I'm waiting for you now and I hope you come for me soon! Take a look at Bella's adoption video, then contact Wayside Waifs at 816-761-8151. Bella's animal ID number is 22475764. Bella's adoption fee is only $25. What a beautiful girl, and it sounds like she'll make the perfect companion for the right people. I hope she finds that nice stable home that she needs. Sharing. Bella is beautiful, not sure where they got the visla from. Hope she finds a home soon. Bella sure looks like such a sweetie. We will share her. Bella looks like a happy dog that will make someone very happy. Hope she finds the right home soon. What a sweet face! We'll share Bella also, hoping that someone falls in love with her! She is beautiful. Will share. She is beautiful. Hope she finds the right home.